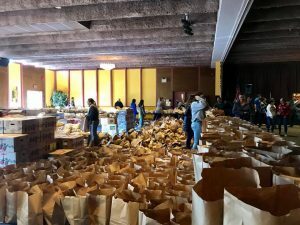 For the 43rd year, United Neighborhood Centers (UNC) held its annual Thanksgiving Food Basket program to help needy families this Thanksgiving. Recipients lined up outside of St. Mary’s Center in Scranton on Nov. 21 to receive their turkeys and three grocery bags of food, containing all of the traditional Thanksgiving sides and fixings. UNC was able to provide for more than 1,000 families this year to cook a Thanksgiving meal in their own homes, thanks to the generosity of our community and our nearly 250 volunteers. Without them, we would not have been able to accomplish our goals. From all of us at UNC, we are so grateful for everyone’s help. Happy Thanksgiving to all!